Crispy bruschetta toasts with gorgonzola cheese spread on top and a fresh fig with balsamic glaze. 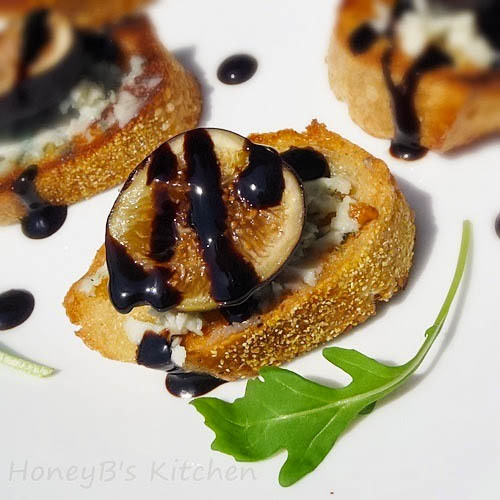 Fig and Gorgonzola Bruschetta with Balsamic Syrup are pure appetizer deliciousness with a creamy, crispy, and fresh mouth feel! I love snacking. Actually, I snack more than I eat a meal or I consider my snack a meal! I also love to read my foodie magazines. I read several of them but the one that inspired me today was Every Day with Rachel Ray. Rachel has really gotten where I wish I could be….in a way. I am a good talker and I love to eat…but to stand in my kitchen and talk and cook – that I don’t think I could do. When I cook, I want to be left alone. I don’t want people hovering over me much less do I want to have to be “scripted” in anyway. However, a show like her Tasty Travel’s show….now that I could do! Give me food someone else has made and let me talk about it – I’d be awesome at that! Probably most of my family, friends and co-workers that I’ve carried on conversations with would tell you how my topic of conversation always goes to food! I was certainly blessed with the gift of gab. With all that said, I was going through the August 2011 issue of Every Day with Rachel Ray and saw an article titled “Bruschetta – 9 ways” Immediately I had a craving for crusty bread with spreadable cheese and fruit. While my combination was not one of the 9 ways in the magazine, it’s a twist on a couple of the ways. I finally, for the first time ever, found fresh figs in a grocery store. I also was craving some gorgonzola and of course, I had that yummy balsamic syrup that I used on my Caprese Panini that I knew would go well with my bruschetta. Spray slices of baguette with butter spray and place on cookie sheet. Broil until lightly toasted, flip and toast other side. Keep a close eye on your baguette slices as they will burn quickly if you decide to not pay attention to them! 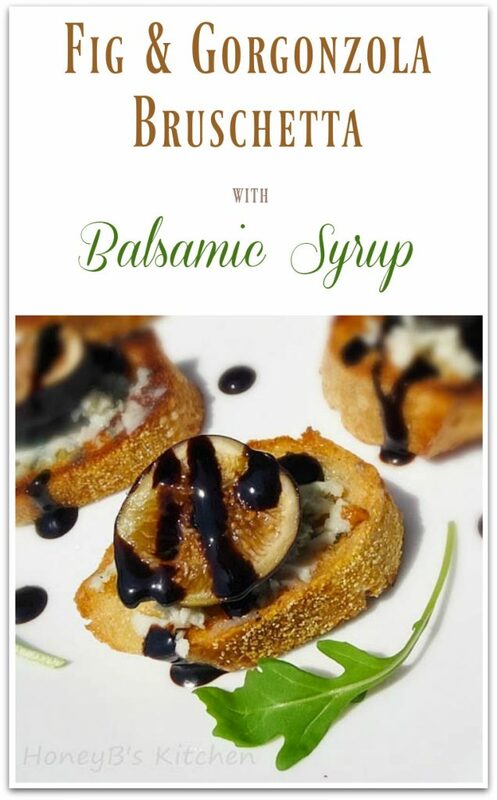 Remove baguette slices from oven and spread a small amount of Gorgonzola cheese over warm slices and top with 1/2 fig, drizzle with Balsamic Syrup…..enjoy! 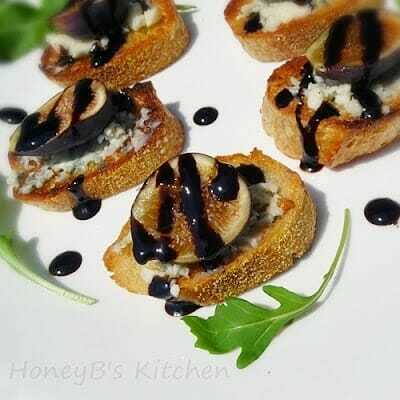 Fig and Gorgonzola Bruschetta with Balsamic Syrup – Pin it! I know on your last post it had balsamic syrup that you bought. I've never even looked for it. But thought I'd let you know, when I made that caprese panini, I just took about 1/3 cup of vinegar and nuked it in 30 second intervals for only like 2 minutes and it's perfect syrup. I can't wait to try it with more things! Hey Katrina, I did see that you used your microwave. I'll try it when I'm home and Grumpy won't be around for a while. He really disliked the odor reducing it made. However, it is YUMMY stuff! This looks so delicious, Shelby! Perfect little snack or appetizer. Oh man Shelby this looks fabulous! been eating balsamic this summer on everything. i honestly don't know why i crave it so much. there has to be a mineral or vitamin in it for me to crave it. so you can imagine how good this looks Shel. I adore figs with balsamic and your preparation looks wonderful. Great recipe with beautiful pictures. So simple, yet it looks very impressive! I love these type of snacks! Love figs so much, this would be great for a party! That looks absolutely amazing – the fig and cheese combination alone is great, but the balsamic on top of it. oh my. this is gorgeous, i have a sweet balsamic vinegar that would be perfect. i'm off to snag some figs!